Hey guys, in case you haven't heard about my Anlene craze lately, I've been obsessed with the new Anlene formulation featuring 50% extra nutrients! Been pretty active in catching their on-going campaigns from RM1 breakfast hunting, to truck hunting, to even meeting Stacy Anam in person to jump with her in the heart of Kuala Lumpur. To be honest, I truely find campaigns as such really exciting to be a part of. So if you missed out on the excitement, here's a little breakdown on how my month went. To those who know me pretty well, you would be aware that im very active in sports and also not to forget my ballet classes which I have to attend on a weekly basis. Getting older each day, I noticed that my level of energy and strength is slowly reducing, thus leading me to a solution to help keep my energy and bones strong to ensure that I can keep up with my active lifestyle. The reasons why I took part in this month's Anlene campaigns is mainly to understand the new formulation upgrade and also to basically snag some insane deals to save me some $$. Hehe. Here's what that went up! So, starting my month off with some Anlene goodness, I managed to grab myself an RM1 breakfast where I managed to grab myself 1 box drink of Anlene milk and a pack of bread to keep myself energized throughout the day. What I admired the most was that i never realized that breakfast is truly one of the most important meals of the day. I usually skip my breakfast thinking that I don't need that much of energy in the morning, but the truth is, when I actually consumed breakfast in the morning, it made me feel more productive during the day! Guys, legit all you need is a box of Anlene and bread to understand how much difference it made my day. Next, i was told that they were having a Roving Truck roving around Klang Valley. 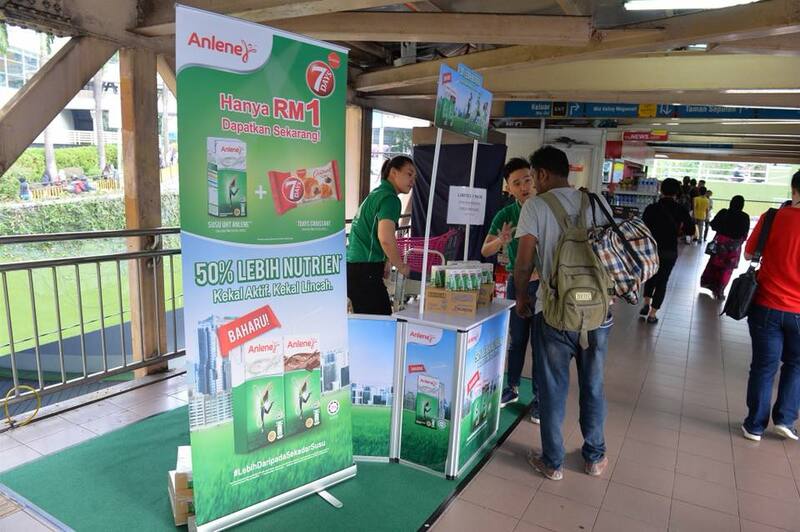 Lucky enough, I managed to catch one of their roving trucks in Kuala Lumpur via MRT and had a good time enjoying free testers and pretty cool activities planned by the Anlene team. But one of the highlights to me was the offers that the Roving Truck was offering. With deals that are hard to resist, I just had to get my hands on some Anlene goodness to stock up my fridge at home. Here, I managed to get 3 sets of Anlene milk at only RM10! Usually, a set would cost about RM6 on average, but im pretty happy that I managed to stock up before they went out of stock. Coincidently, while I was catching the roving truck, I managed to also meet the none other Stacy Anam! I remember during my high school days, I used to watch her sing on 'Akademi Fantasia' and being able to see her life was pretty spazzing. Pretty happy to see her on the wagon to keep her body nutrients up with Anlene, setting a good example to her fans to follow too! I was eager to get a photo with her while jumping, but this photo would do I guess since she had tons of fans lining up to get a photo with her as well. 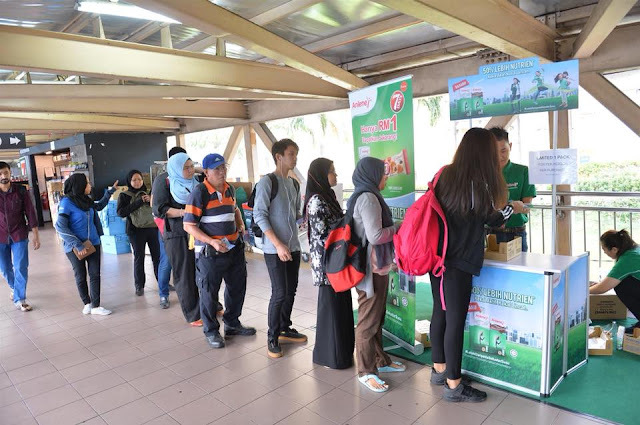 In conjunction to that, Anlene also had an app challenge they are required to run on the spot to get yourself a free sample from the roving truck, which I believe everyone who participated had a good time breaking a sweat while getting a complimentary Anlene drink as a reward. Just to conclude my memories of the month, I have been a loyal consumer of Anlene milk (specifically chocolate) and I realize that my bones do feel stronger and not to forget that I do feel a boost of energy each time I consume a box of Anlene milk. YUMS! Believe it or not, I even stock up some Anlene Milk in my office fridge just in case I need that extra boost of energy when I need it. With Protein, Collagen, and Calcium being packed in one nutritional drink, you can never go wrong with Anlene cause im living proof that it helped me maintain my physique. THANK YOU ANLENE! Psst, did you know that you can request for your free sample on Anlene from their official website? The link will be below, and you're welcome!